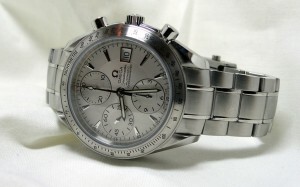 Omega Speedmaster Ref. 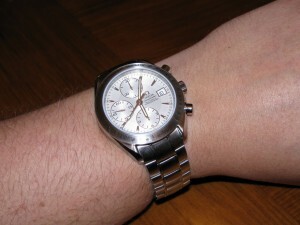 3211.30.00 Watch Review. Around a week ago, I received an amazing e-mail. 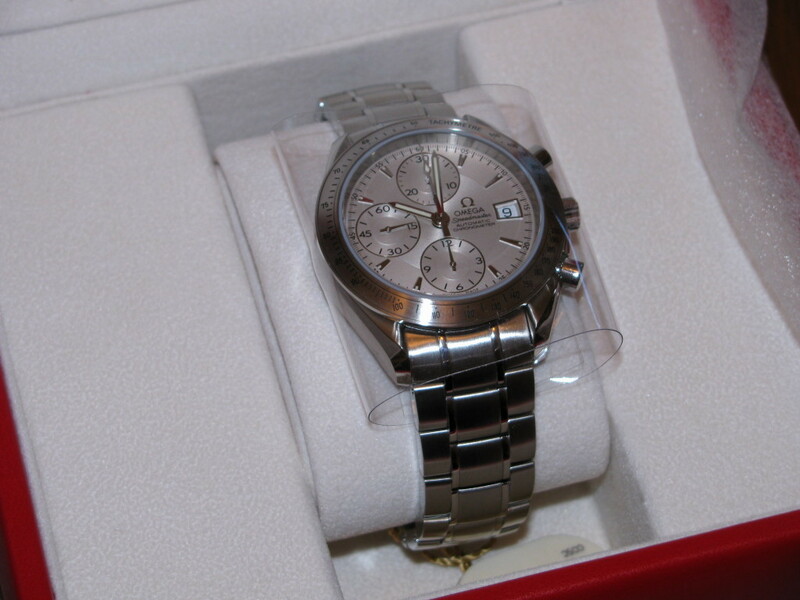 I had won an Omega Speedmaster, in silver in a sweepstakes from Lussori Jewellery. At first, I had my doubts, but I called, and it is all legit. Exactly one week later, I received it via UPS. The watch comes in a heavy, leather wrapped box with an embossed Omega logo. 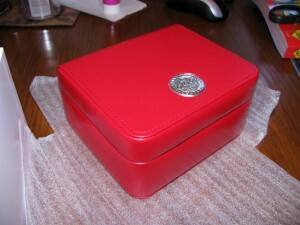 This box is inside of a simple, white cardboard outer box, with Omega logo embossed on it. The leather box is lined with white satin and contains the watch, user’s manual, and certification cards for the warranty, COSC certification, and features of the watch. The manual is large, but a little disappointing. The English section is 44 pages long and covers the full range of Omega watches, not just the Speedmaster, so you have to sift through all the different movements to find the one that applies to yours. This type of manual is typical of mid tier watches, and it really surprised me that a watch in this price point would have similar. A typical Seiko manual is about 20 pages long and is specific to if the watch is an automatic, kinetic, or quartz. Overall, the presentation is very nice but not outstanding. Now, off to the actual watch review. The Omega Speedmaster is an automatic, 1/8 second, 12 hour chronograph and chronometer. The case is a nicely sized 40mm. Large, but not huge, and well suited to average to smaller wrists. If you want gigantic (over 44mm) look at the Seamaster watches from Omega. It is all stainless steel with all perfectly finished surfaces and edges. The crown is signed with an the Greek letter Omega. It is a little small and surprisingly hard to manually wind due to the crown guards. The pushers work perfectly and have a satisfying click. The top pusher starts and stops the chronograph. The lower resets the chronograph with a flyback action, meaning the hands instantly return to zero when pressed in a snapping motion. The movement is a refined version of a Valjoux 7750 movement with rhodium plating and a heavier winding rotor. The 7750 is a very well regarded, robust movement. This movement has 25 jewels. The 7750 was originally released in 1972, so it has a long track record. I am very happy I received the watch with this movement, I have heard some of the more recent movements have some issues. Give me tried and true any day. The movement is COSC certified, so it should keep within +6/-4 seconds a day. So far, the watch is running at +3 a day. The dial of the watch is a dull silvery, titanium look. There are sub dials at 6, 9, and 12 O’clock. The 9 O’clock sub dial is for the small running seconds hand. The dial at 12 is the minutes accumulator and the one at 6 is for hours. The minute accumulator is a jump style, it does not move until the minute rolls over. The hour accumulator advances constantly when in use. I think one of my favourite features is watching the minute hand jump. There are applied markers at 2,3,4,5,7,8,10,and 11 O’clock. The markers have a small amount of luminescent material that works well. There are marks printed at for every second and ¼ of a second. There are also Arabic markings every 5 minutes. The hour and minute hands are pointed stick types with a generous amount of lume. The chronograph hand ends is an arrow, also with lume. The luminescent material works very well. Not quite a diver’s watch, the Super Luminova glows evenly for hours and is more than usable. The dial, overall, is not that cluttered, despite all of the information displayed. The bezel has a tachymetre scale, black against brushed steel. It compliments the dial and bracelet well. A tachymetre is used when you want to see how many units per hour. Pass a mile marker, start the stopwatch, pass another mile marker, stop. Then, you can simply read miles per hour (or any unit per hour, you just need to have 2 points of reference.) The crystal is sapphire and lightly domes with anti-reflective material on the inside of the crystal. This is my first sapphire crystal and I am looking forward to seeing how scratch resistant it really is. Sapphire is very hard, second only to diamond and carbide. It is very clear looking, but not amazingly better than hardlex (mineral glass). The bracelet is very nicely made, with solid links. It is a combination of brushed and polished stainless steel. Pins and sleeves are used for the pivots. The end links are solid, and should be on a watch in this price range. 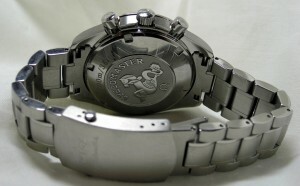 The clasp is signed with Omega Speedmaster and is has two release buttons, but no safety clasp. Of all things, I think the clasp is the most disappointing part of the watch. The steel they use scratches VERY easily. After my first day of wear, it was already showing marks. Even my $100 Seikos look almost a good as new 3 or 4 years later. Another gripe is there are only two micro adjustment holes. 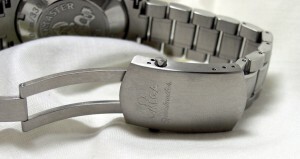 Again, most of my ‘lower end’ watches have at least 4, and up to 8 adjustment holes for a perfect fit. I had to remove two links to get a good fit. This does not bode well for men with larger wrists. I am sure Omega will sell you extra links, so be prepared if you have paws for hands. This is truly a well made time piece. Everything is put together very well and it feels more solid than a Rolex or other watch in this price point. In case you were wondering, it retails for $2850. It is not something I would purchased for myself, but as a prize it is pretty amazing. Compared to other timepieces in this category, it stands up very well. A solid movement from a company known for chronographs. I have always loved the Speedmaster line, and I am proud to have one in my collection. Back: Stainless, deeply embossed with Hippocampus 100M 330FT . Crystal: Sapphire with a light dome, anti-reflective coating on inside. Movement: Omega 1164 Self-winding chronograph, chronometer movement with rhodium-plated finish based on Valjoux 7750. Complications: Chronograph, chronometer, date, luminous markers on dial, small seconds.